“It was a really exciting and fun experience”, student Abraham Gutierrez expresses his words towards the 11th grade college trip. The trip consisted of 46 students, and was splitted into two groups of 23 students. 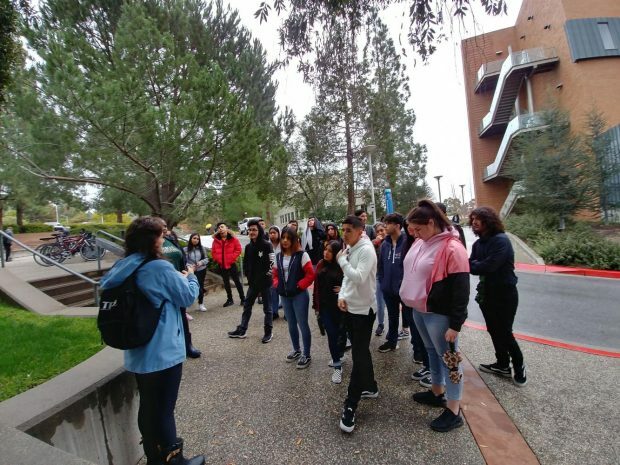 Those two groups each had the chance to visit diverse colleges and allowed them to get a much more in depth look at the lives of college students. This trip in total was 3 days long. Tour two chaperones by US History teacher Miguel Sandoval and English teacher Uriah Lee, on the other hand also visited UC Santa Cruz then later took a turn towards CSU Monterey Bay, Cal Poly San Luis Obispo, and UC Santa Barbara. Like tour 1, tour 2 visited UC Santa Cruz the second day and after the separation they went towards CSU Monterey Bay, where after they eventually headed to the hotel to rest. The third day, they visited Cal Poly San Luis Obispo and UC Santa Barbara, once the tour at UC Santa Barbara ended they headed back towards APB. Junior Abraham Gutierrez mentioned a couple words towards the trip and his experience. He said, “It was very well worth it because I got an opportunity to go around and seek potential colleges for me, like for example UCSB looked nice and offered a major that I look into”. For Abraham the trip was a good experience because he was able to get out of the house and spend time with his friends outside of school and find a school that could be a good fit for him. Staff members that chaperoned during this trip also enjoyed the college trip. Ms. Cruz stated that there were no behavioral issues during the trip and overall it was a fun experience for the students to start getting an idea of college. She did however mention she wished we spent more time at the colleges to let the students explore a bit more and get to talk to college students about life in college. Mr. Sandoval also had a very similar response about the college trip explaining how it was a fun experience to get to know his students better, but he wished that the groups did no separate because it took away the feeling of everyone being together. The college trip was a success in the eyes of both students and staff and was well worth it. To all the sophomores contemplating the idea of going on the trip, it is one of the best experience you can live. This college trip is one of the best college experiences APB can offer by allowing students to go to the actual campuses and get insight of what colleges can offer. The 11th grade college trip was a fun and an educational experience.